Proper hand washing can help to protect your hedgehog from potentially dangerous bacteria or other substances on your hands. Hand washing protects you from having your hedgehog take a sample bite of you! It is only critter nature to want a sample if your hands smell like food or something tasty. An unscented or lightly scented antibacterial soap is best. Some scented soap such as fruit varieties might smell appetizing to your hedgehog. Avoid alcohol based hand sanitizers as the hedgehog may lick your hand. When picking up your hedgehog, many prefer the “JUST DO IT” method. The more confidence you have with your hedgehog, the more secure the hedgehog will feel with you. It is important to move steadily and confidently. Certainly picking up a hedgehog doesn’t hurt nearly as bad as getting a shot, but the spines are sharp and they are going to prick you to some degree. How you handle your hedgehog will determine how much they prick you. Compare picking up a hedgehog to a nurse giving you a shot. You don’t want her to ram the needle into you, but at the same time, you don’t want it to be drawn out and extremely slow. Steady and confident are characteristics you want in a nurse and a hedgehog wants in you. When you move fast and jerky your hedgehog may feel you are attacking him or her. Other hedgehogs may prefer to smell your hand before being picked up. This method simply requires you to place your hand in front of your hedgehog to feel comfortable knowing that being picked up is about to happen. Observing your hedgehog’s response to different methods of being picked up is key in determining what is most comfortable for your hedgehog. Use both hands to lift your hedgehog by sliding your hands under the hedgehog. Lift the hedgehog like you would lift a pancake or omelet rather than scooping it like you would a liquid. Some people prefer to use the sides of their hands to slide under the hedgehog from the side and other people use their fingers to slip under the belly. You can also use the side of the cage to roll the hedgehog onto your hands if you can’t get your hands on both sides of the hedgehog. You can also lift your hedgehog by scooping up bedding when you lift the hedgehog up out of the cage. The bedding acts as cushioning for your hands. Soft fluffy bedding tends to work well for this purpose. Probably the easiest way to pick up your hedgehog is when your hedgehog is in its sleeping bag. When your hedgehog is in its sleeping bag simply pick up the bag and begin talking to your hedgehog. Hedgehogs naturally use a roll or a fall to make their descent so gently rolling your hedgehog out of the sleeping bag onto your hand will not cause too much additional stress. It is completely normal for your hedgehog to ball up when you are picking it up. 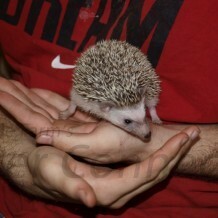 Balling up is a hedgehog’s natural defense and hedgehogs have an instinctive fear of being picked up. After all, everything that picks a hedgehog up in the wild is dangerous! Some hedgehogs always ball up when they are being picked up, and other hedgehogs don’t mind once they are comfortable in their surroundings and with their handlers. Just because a hedgehog balls up when it is picked up does not mean that it shouldn’t be handled, as hedgehogs typically relax the more they are handled. While picking up your hedgehog can cause minor discomfort to the hedgehog (especially when quilling) it is important to work with and handle your hedgehog on a regular basis. Huffing and puffing is completely normal hedgehog behavior for some hedgehogs when they first wake up. Once your hedgehog is picked up or out of its cage, do refrain from further irritating your hedgehog by attempting to stroke it or pet it without it being fully awake. Whether you are holding your hedgehog on your flat hands or allowing your hedgehog to wake up on a pillow or other soft surface, simply give your hedgehog some time to gain confidence in its surroundings. Keep in mind, some children wake up running and other children need some time before they are active and social – hedgehogs are the same way! Many people find that using gloves to pick up their hedgehog helps them pick up their hedgehog with confidence. See the “Gloves and Hedgehog Handling” article for more tips and suggestions. Some people choose to use a kitty litter scoop to gently lift their hedgehog up out of its cage. We don’t recommend using this method, because the hedgehog won’t get used to you and it will make handling more difficult in the long run. Hedgehog prickles may leave little red marks on your skin, and depending on your reaction to the prickles, they may itch. Many people find that this irritation is a minor inconvenience and that it does not occur at every handling.